Have you ever heard of a “food desert?” For most Americans it’s a foreign concept. Think of it this way: you need to feed your family but you have no car, and the nearby corner store often has little but chips and candy. There may be a basket of a few apples or bananas, but no vegetables, no variety of fresh fruits. In order to get nutrient-dense options you need a bus. More than one actually. You will need to navigate a couple of bus routes to get to a decent grocery store, and then retrace your route, carrying what you can. In most American communities there is roughly 1 grocery store per 10,000 people. Until last week, Woodlawn had several corner stores and an Aldi for 24,000 residents. Because of its location, many have to take multiple buses to get to it. If you include the neighboring communities, the population without a full service grocery store goes way way beyond that. “In so many neighborhoods, if people want to buy a head of lettuce or salad or some fruit for their kid’s lunch, they have to take two or three buses, maybe pay for a taxicab, in order to do it,” former First Lady Michelle Obama took on the issue of food deserts back in 2011. She spoke to community leaders about the fresh food shortages in underserved communities across the South and West sides of Chicago. For those who have grown up in Woodlawn and neighboring communities, such as Sunshine Enterprises graduate chef Tiffany Williams, who owns Exquisite Catering, the issue of fresh food shortages has existed her whole life. For the past several decades access to fresh produce was limited. “Growing up we had a few grocery stores such as Vitos and Farmers. We went to Farmers for protein and starches and Vitos for milk, cereal, and snacks. We didn’t have many options for fruits and vegetables. There were no options within walking distance for fresh items.” This has been the narrative for countless families in Chicago. Accessing fresh fruits, vegetables and meat is often such an ordeal, that many parents simply can’t manage it. Sunshine’s Executive Director Joel Hamernick expounds, “The long term consequences of being deprived of access to healthy food is extreme. The lack of good food options affects the mental, emotional and physical development of children and adults. It is a not an insignificant factor in understanding why life expectancy in Washington Park is 20 years less than that of Hyde Park” (2 adjacent communities on Chicago’s southside). On March 7th, a big step towards changing this long standing condition for Woodlawn and south Washington Park occurred as a new Jewel grocery store opened on 61st and Cottage Grove, just down the street from Sunshine. “One of the most pressing issues residents in the 20th Ward share with me is the extreme limited accessibility to real food options. On the day of the opening, I noticed this sense of relief, pride, and joy among those who were able to conveniently walk from their home to a real grocery store, that wasn’t a gas station or corner store. This is what every Chicagoan deserves, and finally it’s the 20th Ward’s turn,” shares Nicole Johnson who is running for 20th ward Alderman. At Sunshine we celebrate the opening of a neighborhood grocery store. It’s a too easily overlooked aspect of what is needed for a community to flourish. One other fun fact: Years ago we had a vision to be a catalyst for 200 jobs on 61st Street. 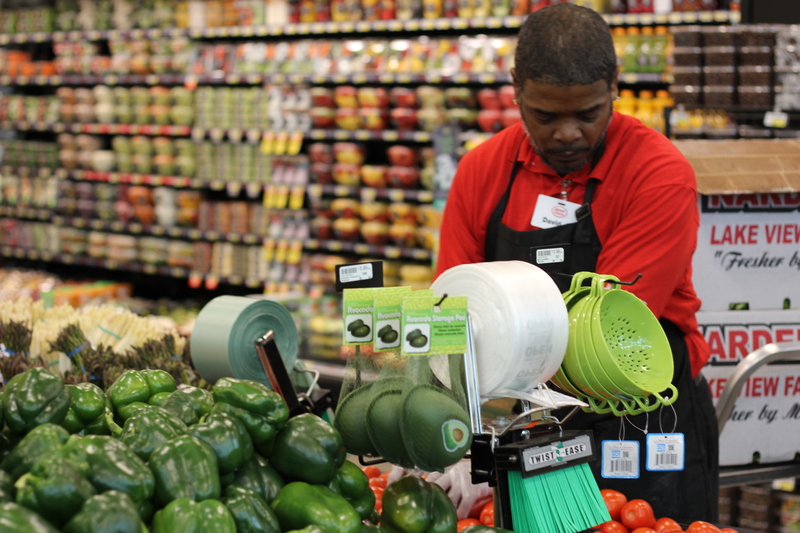 God is using the resources and opportunities that Jewel-Osco has brought to help fulfill and exceed that vision. Amazingly, it is projected to create 300 jobs at 61st and Cottage Grove. Rejoice with us as we now dream even bigger.